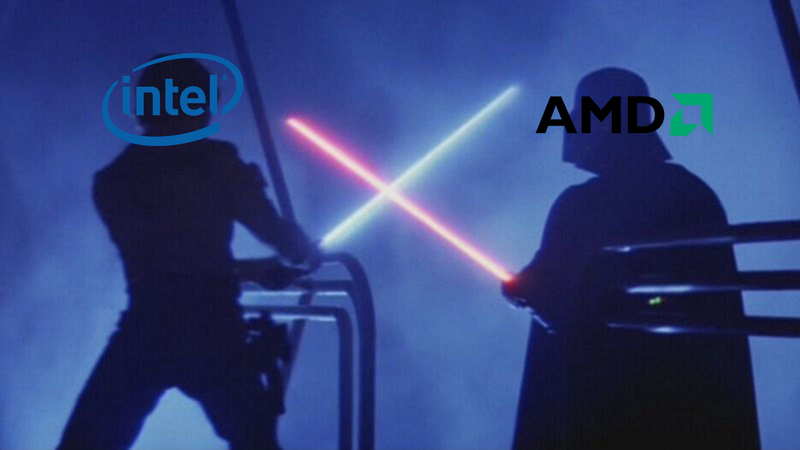 I'd wondered what to call this article, with Computex coming to a close, AMD and Intel both beefing up their High End Desktop (HEDT) platforms, and the new Star Wars Solo film that just came out, Core Wars seemed appropriate. It feels like yesterday Intel had just released the i7-6950X, a 10c/20t Broadwell-E CPU for the X99 platform for a whopping $1700, then just a year later we saw AMD release the new Ryzen CPUs based on their Zen architecture, offering 8c/16t for as little as $329. 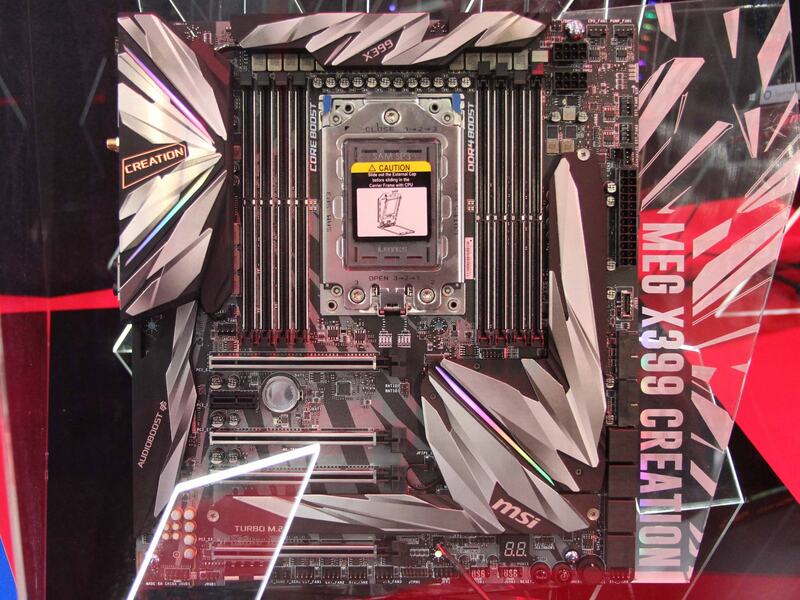 Just months later in Computex 2017, we got X299 and X399 announcements, a new hope for HEDT enthusiasts. X299 promised more models than any Intel HEDT platform before, ranging from 4c - 18c at much more compelling price points. X399 offered less models than Intel's X299 platform, but promised better pricing and more PCIE lanes for enthusiasts who run multiple GPUs, PCIE SSDs, NICs etc. Well, here we are a year later, Computex 2018 is over and things are gearing up to be even more exciting, the empire struck back... and I really can't find a way to fit in some Return of the Jedi line. Anyway, by now you've probably heard the news about Intel's 28 core Cascade Lake CPU and AMD's 32 core Threadripper Gen 2 CPU, and if you haven't, well, I guess you now know. In this article, I'd like to take a look at some of the models we might see, the performance we might expect, pricing, the architectural differences between them and where Intel and AMD can go from here with regards to their HEDT platforms. Let's start with Threadripper Gen2, it will be up-to 32 cores / 64 threads with a 24 core / 48 thread model as well, these top-end models will have all four dies enabled, but only two dies will have direct memory access, so they'll still be quad channel - presumably they also won't be wired for PCIE, so expect 64 PCIE Gen3 lanes maximum (60 usable, 4 for chipset). While not confirmed, it's also expected AMD will refresh their two-die config TR, so expect new 8c, 12c and 16c models as well. 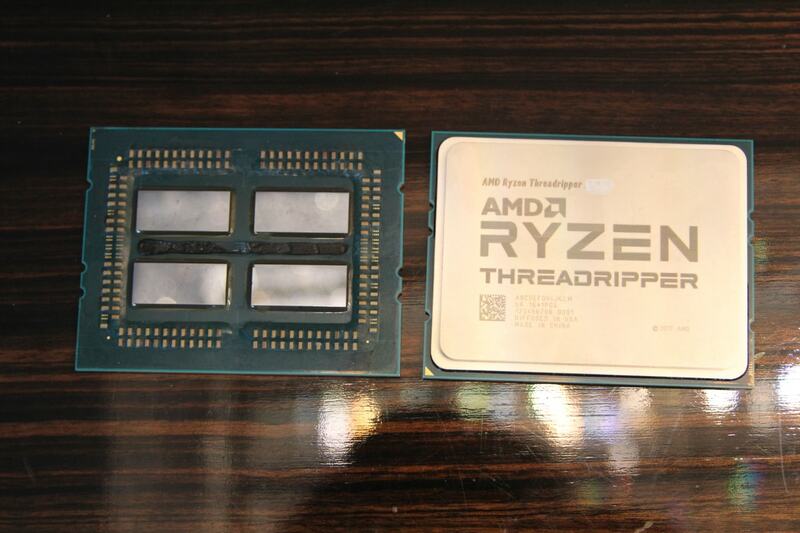 All Threadripper Gen2 will be based on AMD's 12nm, Zen+ architecture, so similar to Ryzen 2000, you can expect better memory support (should have official DDR4 2933MHz support), better clock speeds (by around 200-300MHz) and better boost algorithms. What's also nice is you can use existing X399 motherboards, all that is required is a BIOS update beforehand and you can drop-in a new 2nd Gen TR CPU into an existing system. At Computex 2018 we also saw two new X399 boards from Gigabyte and MSI, both featured better VRM cooling and designs and should release alongside AMD's 2nd Gen TR CPUs, which are expected sometime in August 2018. The TDPs for the high end 24c/32c TR CPUs are expected to be 250W, although could go as high as 300W depending on final clocks and voltages, rumour has it the base clock for both the 24 and 32 core part is 3GHz, and the boost speed for both should be around 3.4GHz. 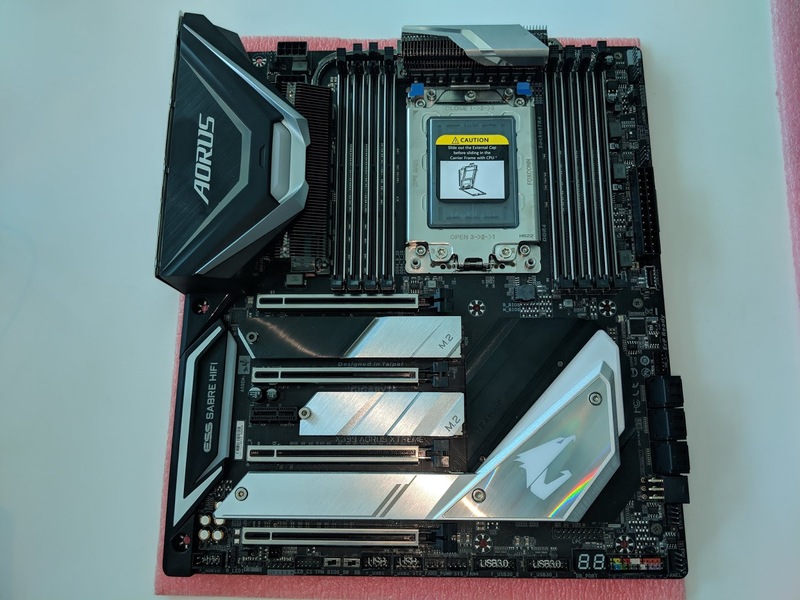 It was anticipated we'd see newer X499 motherboards, however this doesn't seem to be the case, according to ASRock, X499 has either been cancelled or pushed back, with no further clarification. Personally, depending on how Intel position Cascade Lake, I think it's possible that later on we could see X499 motherboards wired to take full advantage of the four-die config TR CPUs, this could mean you'd get the full eight memory channels and 128 PCIE Gen3 lanes as opposed to the four memory channels and 64 PCIE Gen3 lanes you get with X399 - of course this is just speculation on my part, so please take it with a grain of salt. As for pricing, how much are these CPUs likely to cost; well before speculating on this part, I'd like to take a look at how AMD priced the 1950X, this CPU launched last year with an MSRP of $999, which if you divided by two would give you $499, which was the MSRP of the highest end Ryzen 7 SKU, the 1800X, basic maths would indicate that a 32c TR CPU would likely be double that of the 16c TR CPU, which would be $1999. However, AMD was a lot more competitive with Ryzen 2000 pricing than they were with Ryzen 1000 pricing, the highest end Ryzen 2000 SKU, the 2700X has an MSRP of $329, times that by four and you get $1316. While it's unlikely to be this inexpensive, I imagine the cost of the final product will be somewhere between those numbers, which for a 32c is very reasonable. The cheapest single socket 32c/64t EPYC model, the 7551P also has an MSRP of $2100, so I feel pretty confident about a non-enterprise product being below that price point. The biggest drawback I can see thus far is the fact a four-die config TR CPU, in an X399 board will have two 'slave' dies, that have to share memory (and presumably PCIE connectivity) with the other two 'master' dies, I've created an illustration below, such a design will add latency and may hinder scaling. Of course we'll have to see what the final product performs like, it's possible AMD could have done architectural tweaks or package re-designs to help mitigate issues. In an interview with PCWorld, AMD's Jim Anderson said the Ryzen Master utility for TR Gen2 would come with new features, I'd imagine we'll see something similar to Process Lasso where you can select an application (such as a game) and limit it to a certain amount of cores/threads, or possibly dies to minimise latency. And should AMD create a higher end chipset wired for all eight memory channels and 128 PCIE lanes, then each die would have direct memory and PCIE access. I imagine the final lineup will look something like this. Which will be a much more compelling lineup with more models at varying price points. Intel's Cascade Lake will be up-to 28 cores / 56 threads, no other models were announced, no CPU photos, die photos or chipset announcements. Cascade Lake should feature official support for DDR4 2933MHz, up from the previous 2400/2666MHz support Skylake offered and is rumoured to have more L3 cache, and possibly an increased Mesh speed, which should help reduce latencies and decrease the deficit it has with Broadwell-E in some applications. Presumably there will be lower core count options available but we'll dive into this a little later. Intel demoed a 28core CPU running at 5GHz, now, contrary to what a lot of the media is spouting, this CPU does not have a 5GHz base clock on all cores, this was overclocked, which Intel conveniently 'forgot' to mention and it was being cooled by a chiller that has a theoretical cooling capacity of 1770W, the specific unit being used was a HC-1000B. 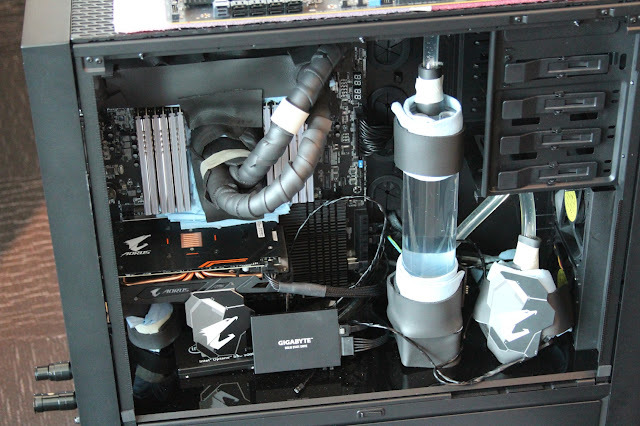 The motherboard being used was also insanely overkill in terms of VRM layout and cooling. Nevertheless the performance shown was amazing, scoring a Cinebench score of 7334, at the Asus ROG booth there was a regular watercooled version, apparently clocked around 4-4.2GHz that scored around 6100, so rest assured, even without a chiller, you should be able to cool these beasts with a good all-in-one or liquid cooling setup. 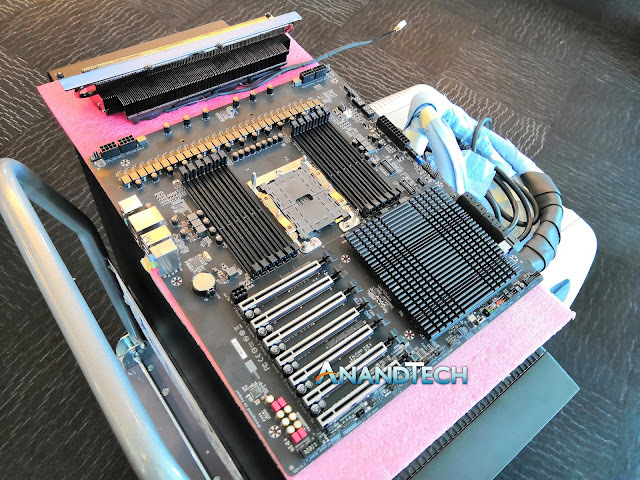 For Skylape SP, Intel had three die versions, the Low Core Count (LCC) die, which is up-to 10 cores and comes in at 322 mm2; the High Core Count (HCC) die, which is up-to 18 core and comes in at 484 mm2; and finally you have the Extreme Core Count (XCC) die, which is up-to 28 cores and comes in at a whopping 698 mm2. Now, Intel could just take their existing XCC die, fabricate it on 14nm++ (instead of 14nm+) add the enhancements the Cascade Lake architecture provide over Skylake, stick it on the LGA3647 package and call it a day. However such a part is likely to be very expensive, as larger dies have lower yields. An alternative, is Intel could create some type of Multi-Chip-Module (MCM), similar to what AMD do with Threadripper and EPYC, instead of using a single monolithic die, you take multiple smaller dies and interconnect them together, AMD use Infinity Fabric and Intel have what's called Embedded Multi-Die Interconnect Bridge (EMIB), and we've already seen it being utilised with the Hades Canyon NUC, the HBM2 and Vega dGPU are connected not by a regular Interposer, but by Intel's EMIB technology. Intel has also apparently been working on Cascade Lake MCMs, presumably EMIB, so I wouldn't be surprised if for the final product, instead of one monolithic XCC die being used, Intel use EMIB to 'glue' together smaller LCC and/or HCC to create higher core count CPUs, it would also give them move flexibility for their product stack. It's likely some PCIE lanes and/or memory channels might have to be disabled, not just because of Interconnect and packaging constraints, but to stop cannibalising Xeon sales. These CPUs are also using Intel's enterprise grade LGA3647 socket and support six memory channels, no LGA2066 for these beasts, judging from the fact we only saw one X299 board at Computex, which was a refresh of EVGA's MATX board, I'm going to go out and say I think Cascade Lake CPUs will be moving to an entirely new socket and chipset. It would be too fragmented and confusing having LGA2066 Cascade Lake CPUs, that would presumably be 18 cores max, quad channel and have 44 PCIE lanes max and then having LGA3647 Cascade Lake CPUs that would be 28 cores max, six channels and have 48 PCIE lanes max ~ (presumably) and then having Socket 2066 boards, as well has Socket 3647 boards, it would be messy and confusing, which was bad enough with X299 and Kaby Lake X/Skylake X. Instead I think Intel will unify Cascade Lake with one socket and one chipset that will span the entire lineup, and we already know Intel is preparing X399, which typically wouldn't happen if this was a refresh, X79 spanned Sandy Bridge-E and Ivy Bridge-E and X99 spanned Haswell-E and Broadwell-E, yet here we are, one year into Skylake X and Intel is already prepping a brand new chipset and socket with higher core count and memory support. For core count options, I believe it will span from 10 core all the way to 28 cores (going up in two), with multiple models fitting a variety of price points. With regards to pricing, I imagine the LCC and HCC Cascade Lake CPUs will be very similarly priced to the existing LCC and HCC Skylake X parts, if not cheaper due to increased competition and an improved process node that should yield better. For the pricing of the 28 core part, well, if Intel use EMIB to glue together two HCC dies, you could expect the pricing to be somewhere around $3000, simply take the price of the 7940X (14c/28t), times by two and add a little for the EMIB package complexity and additional packaging costs of the 3647 package. If Intel stick with their traditional monolithic die solution, this is where it gets a little more complex, the cheapest 28c/56t Intel Xeon I can find is the Xeon Platinum 8176, which has an MSRP of $8719, now it's worth pointing out almost no business or data centre would pay this much per part, they't buy in bulk or cut special deals, this is the price the end user would pay if they were to buy it separately, however it gives us some indication of what the price could be. Now, generally Xeon CPUs carry roughly a 30-40% price premium over non-Xeon CPUs, not only are Xeon CPUs highly binned, have ECC memory support, QPI links and other baked in features, but they're aimed at a market that pays more. If we deduct 35%, we get $5667, which truly is an insane price, now, the final product could be cheaper than this, Intel might reduce their margins on such a part or they've been gouging these parts excessively, I really don't know. If we apply the same formula to Intel's cheaper, entry level XCC part, the Xeon Gold 6138, which has an MSRP of $2612 and we apply the same 35% reduction, we get $1697, which really isn't too bad for an overclockable 20c/40t CPU with six memory channels. The drawbacks for such a platform are you'll most likely need a brand new motherboard and chipset to support these CPUs and the elephant in the room is the price, power consumption and cooling aside, the pricing of these CPUs, especially if they go with monolithic die solution, truly will be astronomical. The Core War is in full effect and shows no signs of slowing down, you may be wondering, where can we go from here, well, it's hard to say exactly what will happen in 2-3 years time, obviously even more cores/threads for a start; I think future AMD HEDT platforms will focus more on clock speed, Zen2 will be built on either TSMC or GlobalFoundries 7nm process, which should allow for much higher clock speeds, higher IPC and even lower power consumption. I think Intel will still focus on on adding additional memory channels and more PCIE lanes, but we will just have to wait to see how 10nm+ and Ice Lake turns out. So just before I was due to publish this article, several sources, the original being PC Watch are reporting that Cascade Lake has been delayed until 2019, and instead, Intel will be refreshing X299 with newer motherboards and up-to a 22 core Skylake X model. I'm unsure as to whether the XCC die could fit on the LGA2066 package with enough room for the IHS, and the HCC die maxes out at 18 cores, so it possible Intel may be creating another die that sits in between the HCC (18c max) and XCC (28c max) die, this would be used for Xeon-W CPUs, and a future X299 refresh. Please take this information with a grain of salt, it's very recent and there could be translation issues. That wraps up this article, this is the first article I've ever written for Tech-Toniks, so hopefully it was fun to read and gave an insight into what could happen to the future of both AMD and Intel's HEDT platforms. If you have any criticism or questions, please leave a comment below.